Our Business is temporarily on hold - please check back again later. ​Modern chess variants such as Crazyhouse can now be played in person! Search available options and start playing in a whole new way! For rules of play and links to great tutorials check out our chess information page. Looking for an heirloom chessboard that can be used for generations? You can customize your own chessboard or choose from our selection of beautifully handmade boards. We offer solid hardwood boards and veneer boards. All of our boards can be made to match the game sets listed above. We offer boards to complement smaller existing sets as well as full-sized regulation boards for those with competition in mind. Childhood wouldn't be complete without the thrill of riding your very own horse. Thankfully, these beauties don't burn through hay or require boarding fees. See our options here or request a custom made horse of your own. These solidly built horses are made from quality hardwood and measure approx. 36" L, 25" H and 14" W.
How do we compete with the big stores? We don't. We build furniture for those with an eye for quality and workmanship unavailable elsewhere. We use the best joinery and fine hardwoods to suit your needs. These pieces are heirloom quality and are likely to be handed down to family. Each is a one-of-a-kind item and is a project you are involved in from the beginning. You can put your own flair into it; feel free to suit your own taste or match an existing set. You will approve material choices and styles along with drawings and other details along the way. Get ready to love your new creation! Design the space of your dreams. Give a gift from the heart to the culinary master you know. We are offering a batch of fine elm cutting boards which are great for all sorts of kitchen tasks. These boards have character as good as it gets. 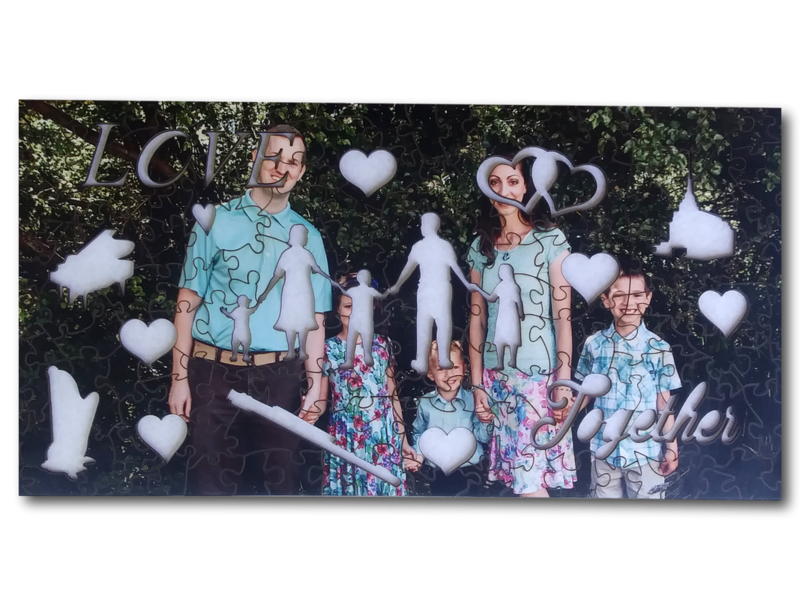 Inlay a family name or personal message. See our available options or custom order today. Let us help you make a name for yourself. This is a great way to help clients get to know you with this personal statement of your own name. These also make great gifts. We can personalize these however you like. Want your company logo on it? We can do that too. We offer carved, engraved and inlay options. Have a great hobby, but can't find the right box? You can get a custom box to help with puzzles, beading, jewelry making and other great projects. Give us a chance to make you smile with these superb answers to your hobby's toughest questions. Have a challenging space? We will work with you to design somewhere you'll want to be all the time. The cabinets below had spice racks installed to the inside of each door. The upper section of this cabinet has a custom pullout for trays. We use the best hardware and can help you find soft-close, touch open and great pull options too. We can also replace or refinish doors, reface or add veneer details to enhance your existing cabinets. You'll feel like it's new again. Let's Start now. Keep your precious child or pet safe with gates for where you need to control accessibility.These gates are built with your needs in mind. Choose hardwood materials to weather rough treatment, or simpler options that can hold up well with milder use. Each set comes with hinges and latches, or purchase your own. Fill out a custom request or buy one we have listed. If you want a custom gate, be sure to upload inspiration photos or a sketch to help get it just the way you want it. Children need furniture to match two things: their size and their level of energy! Really, children need small scale furniture that is durable as can be. With children of our own, we have developed a small table that can be used and enjoyed and that we know can hold up to your children's creativity. Check out our children's furniture page to view available options. If your furniture has grown tired and mundane, don't throw it away! With refinishing, you can upgrade saggy style and appearance that is the next best thing to new and do your pocket book a favor! We can use the color of your choice or help you navigate choices, hardware or distressing. Let's give it a new look. 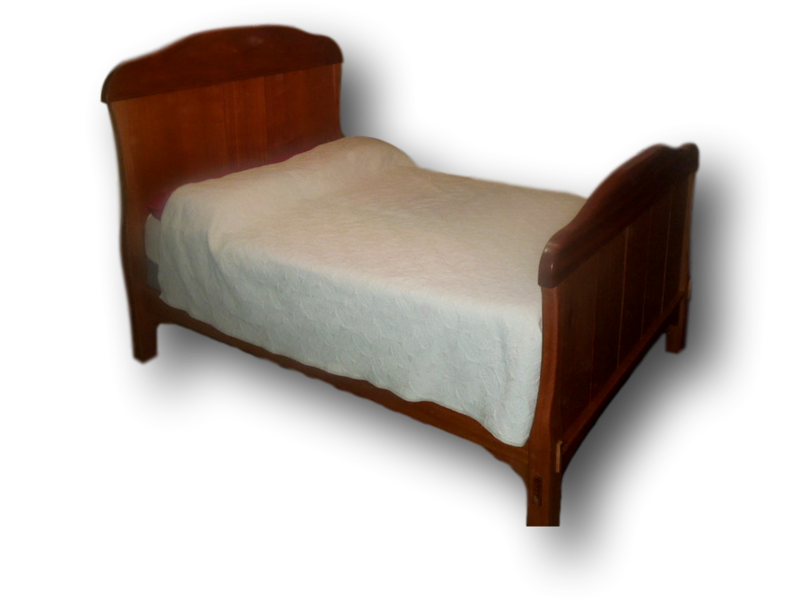 ​We are also happy to help with restoring the natural beauty of wood to antique or relic furniture. Think you have a valuable antique? Sell it decrepit or restore it; both happy endings. Originally carved as an advent calendar, these and other carvings are done by hand and are unique pieces to help you remember what is important to you. We specialize in holiday decor and use the natural beauty of wood to create stunning reminders of these special moments. Request one or a set and we will fill custom requests as well. Happy Holidays! Jewelry can be customized to suit your taste or theme. Jewelry is made from wood and stainless or silver components. See something you like, we'll get it to you. Try a custom design too. It will be just your style. Tone bells or other musical instrument stands enhance the usability of this set used for Let's Play Music. 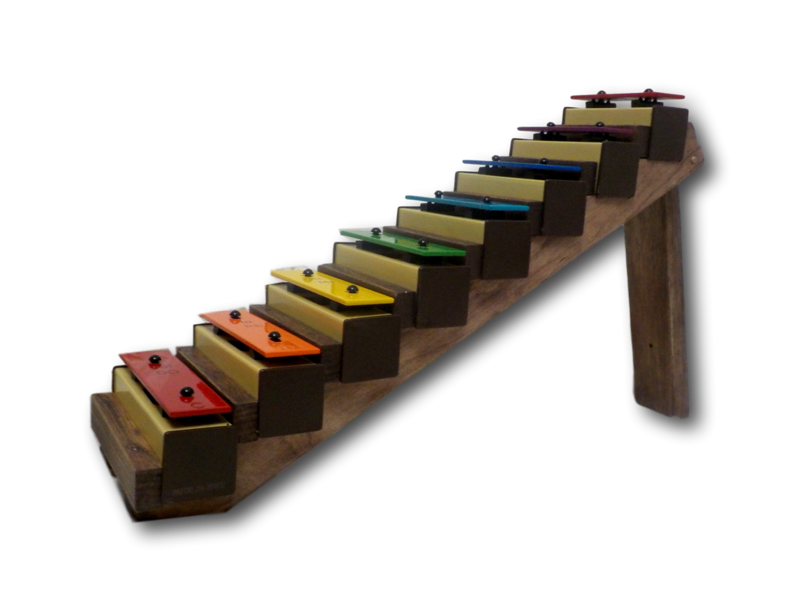 Each bell sits snugly in its own spot and gives a pleasing stair-step appearance for teaching scales. Made of natural pine wood, these stands are stained. The stand collapses for easy storage when the bells are removed. Customize yours here. Matt re painted our 12 year old bedroom set from cherry wood to white! It turned out beautiful and exactly what we wanted. He got it done in a reasonable amount of time too and was in contact with us weeks, even months after, making sure it was still looking good. Very happy with him! And we would definitely recommend him. Matt adjusted the height of our chairs from bar height to counter height. He did an excellent job, keeping the angles of the legs the same so the chairs sit comfortably and are wiggle-free. We found him professional to work with through prompt and informative email responses. The pricing was reasonable and we would hire with him again.